A few more pieces of information about next month's closed season event at Alton Towers have been released. "Towers, Treats and Trails", the old-fashioned style event which will run from February 10th to 25th, will play host to the famous Carters traditional Steam Fair, all the way from Berkshire. As previously reported, entry to the event will be free, and the attractions in Old MacDonald's Farmyard, the Tea Cups and Oblivion will be open - however, all rides (including the fair) will be subject to a small charge. Hotel guests will get access to Alton Towers' attractions for free, but not the Steam Fair's rides. Other things to do will include face painting, junior archery and paint balling. The gardens and ruins will also be open for guests to explore. 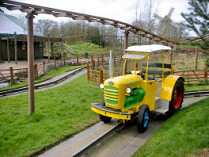 You can find out more information about Carters Steam Fair at their website.